While retirees and young professionals might not always share the same taste in music, one leisure activity with appeal that spans generations is the music festival experience. And in recent years, many ocean cruises have come up with a successful way to capture that excitement. Rock ‘n’ roll-themed cruises are among the most popular “floating festivals.” Varying widely in scope and character, all combine the thrill of live music and the excitement of a cruise, while erasing the barriers between concertgoer and performer. The nostalgia-themed Where the Action Is Cruise features pop stars from the 1960s. That annual event grew out of conversations between 60s bandleader Paul Revere and his Boise, Idaho-based travel agent. “This coming January will be our 24th year,” says Tammy Selee of Concerts at Sea. Unlike many other music-themed cruises, the WTAI cruise is limited to 800 passengers, and reserves only a portion of the ship. Cloud 9 Adventures has been hosting music-themed cruises since 2004, says Kelly Viau, the company’s Director of Business Development. Jam Cruise focuses on musicianship and the interplay between top-notch players. A full-ship event aboard the Norwegian Pearl, Jam Cruise attracts between 3000 and 4000 people for its annual sailing. Jam Cruise features a diverse mix of classic acts (The Original Meters) and hot artists newer to the scene (Kamasi Washington, Dopapod). Viau raves about the Jam Cruise’s unpredictable nature. “You never know when one of the artists is going to break out into melody in the middle of the dining room,” she says, “or when the elevator door opens, and there’s a musician playing acoustic guitar.” She notes that many unexpected musical collaborations take place, and that a number of wedding proposals have happened on the stages of the Jam Cruise. “Punk jazz” vibraphonist Mike Dillon looks forward to the musical camaraderie and “cross-pollination” that’s central to the Jam Cruise. “It really is a jam cruise, he says. “The artist-at-large theme works really well; I get to sit in with different folks, try this, and try that.” Dillon has made many new friendships and musical alliances on past cruises. Morse makes an important point. 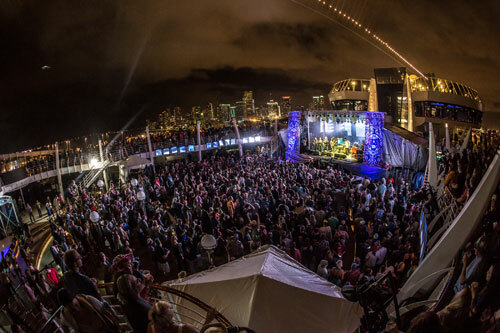 Music-themed cruises combine the very best of the on-board experience with the unique thrill of a huge music festival. But a floating festival like Jam Cruise, Where the Action Is! or any of the many other choices improves upon both by providing unprecedented levels of interaction between the performers and the cruisers. An edited version of this feature appeared previously in Porthole Cruise Magazine.